If this is how Oregon responds to a wake up call, the rest of the country better look out. After a disappointing game at Baylor, the No. 4 Ducks came back two days later to hammer Valparaiso 76-58 for their second win on the season. The Crusaders also found out how good Chris Boucher can be as the center dominated with 25 points, nine rebounds and three blocks. Most of that damage came in the first half as the senior big man poured in 18 points by the halftime break. Fellow big man Jordan Bell helped out with 15 points, seven rebounds and three more blocks to pace Oregon to 48 percent from the field on 27-of-56 shooting. Freshman Payton Pritchard was the next leading scorer with nine points. 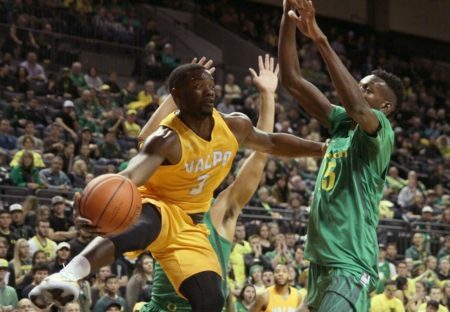 This was the second straight season Valpo came to Eugene, but the team it brought this season was vastly different from the one that lost just by six to the Ducks the season before. Senior guard Alec Peters led the Crusaders with 24 points. Valpo had trouble finding the range all night long as they shot just 32 percent from the field and 4-of-21 from long distance. Oregon moves to 2-1 and is expecting to play its last game without Dillon Brooks. The junior All-American’s foot should be healed and ready to go by the time the team faces Georgetown on Monday in the Maui Classic. The Hoyas are 1-2 after Arkansas State upset the Big East squad 78-72 tonight. The Ducks and Hoyas face off with a 2 pm scheduled tip. The post Ducks Bounce Valparaiso 76-58 appeared first on DuckNews.com.